I love this book and their podcast the Catholics next door. It has helped my faith with prayer, rosaries and so many other faith issues. Very helpful..God bless your family. I found this podcast not too long ago, and I was sad to realize that it had sort of discontinued. I decided to go back and listen to each episode from the beginning - and that has been so wonderful! I have gone through about 130 episodes so far, and I still look forward to the next episode everytime! Fortunately, Greg and Jennifer are now going to add a 20 min episode once a week now, so we should all look forward to wonderful new episodes! is there a 10 star rating? It's sad that the original Catholic couple-cast is coming to a close, but also it's exciting that they're moving on to bigger and better things. Our prayers are wtih you, Greg and Jennifer! This podcast always brings a smile to my face, they are so positive and happy it is hard not to laugh with them. Being in Mexico, I need some good Catholic talk that is in English once in a while and this is a great way to spend the half-hour while doing dishes! Thank you so much for what you do with the podcast, this is my favorite of all of them!! I really enjoy yoor podcast. I look forward to your show on SIRIUS. Thanks Greg and Jennifer for sharing your lives with us and teaching us about the faith. May God bless you on your new work with Sirius. Radio? I don't need no stinkin' radio. I have been listening to this podcast and to the Saintcast for about 2 months, have listened to lots of back episodes, and I have been so entertained, educated and just mesmerized that I don't think I have listened to a radio in that time period! Thanks so much for all your quality work as parents, Catholics, and members of His kingdom! Who knew the iPhone I so desperately wanted for it's awesome multitasking abilities would help me become a better person/parent! It's probably one of the best in all podcasting really. Fun to listen to, informative, interesting, and all-around something worth listening to. And Rosary Army as a whole is such a great apostolate. Keep it up, RA! Greg and Jennifer have this wonderful knack of podcasting that makes you feel like part of their extended family. You really find yourselves inspired by the way they live their lives, dealing with pregnancies, children, their apostolates and now their new show! They provide an excellent podcast that really enriches both how you think about your family and your faith. Thank you! Greg and Jennifer do a great job sharing their lives as a modern Catholic family. There really is something for everyone one here: raising kids, job stresses, finances, and not to mention their striving to be a truly faithful Catholic family. Give it a listen! You won't be disappointed. ...and they do. Greg and Jennifer were just picked up for a satellite radio show. While you can't hear those shows without a subscription, they're still committed enough to their audience to continue producing a weekly podcast. Inspiring to see a family like this. Very honest. Very entertaining. Love it. awesome podcast...keep it up. Glad to hear you're growing your audience. Go get 'em and fulfill that awesome apostolate of yours. God bless you and your family. I've been listening for a long time and I have to say that Rosary Army only gets better with each and every podcast. Greg and Jennifer are not only very open with their listeners but they are also very open to Christ. Which of course means that we get to listen in on their God-led rollercoaster journey! I don't know where to start except to say that I love this show/podcast!! I would hope that's clear when I email and comment to Greg and Jennifer but I'm just not sure! Through this podcast I feel like I know them and so would expect them to know me as well and obviously they don't, because I don't actually know them!! They certainly make you feel like a good friend with every podcast. A great, great show and I pray for them and their apostolate very often! Great Catholic podcast. Glad to hear that it will also be available on XM/Sirius soon. This is a wonderful show to bring Catholic life down to earth. This is a normal couple with children and a life that they share with all the world. They are an inspiration to any family trying to live their lives in a Catholic manner. I've learned so much and laughed along the way. Glad to see Greg & Jennifer recognized as great talent by Sirius radio. And I'm even happier that they will continue this great podcast weekly. A great perspective on the ups and downs of family life. As I was looking for another podcast I found Rosary Army. Even though I'm not yet Catholic, Greg and Jennifer's open way of telling thier stuggles of running Rosary Army and raising thier boys. It's been a great blessing to here that they are true to living out thier faith in this crazy world of are us. The Rosary Army is still as awesome as ever and they are doing well in their transitions from one segment to another. They are honing their skills a little more with every episode. A walk through a couple's life as they strive to do God's will. Interesting how God can work through an average couple to show His will for them. Great show and I will stay subscribed. I've heard them all from 1 to now. Thanks guys I love your show, and never realized how much I need it till you were gone for a couple weeks. Love It! Real people and real life. Listen to how everyday people get thru life with faith, love and hope. Funny, timely, human. I absolutely love Greg and Jennifer. They are so willing to share about their life and their faith! So great, it makes me LOL! I have been listening to the Rosary Army for a year and a half now. and I am continually amazed with the great work they are able to do. It is apparent the Holy Spirt is hard at work with the Rosary Army, and the fruits are plentiful. Keep up the Great work, love your show, and God bless. Greg and Jennifer share their Catholic faith by sharing their lives with us. Greg and Jennifer discuss their faith and family life. Always amusing, sometimes downright funny, and a little something to think about. It's great to be a part of their family. I listen to this on my commute, and find the drive boring while waiting for the next installment. I'll tell y'all the same thing I told Fr. roderick; nix the callers. When i download Catholic podcasts, I want to hear about my Church, my faith,the catechism, The Holy father, the Saints, and most importantly, the Lord. not Joe Schmoe from Kokomo going to a mens retreat and not really offering anything of any great worth. You do your listeners a great disservice by using all this filler. 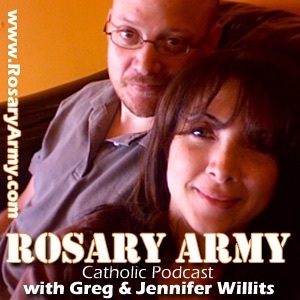 If you are looking for a podcast that will make you laugh while helping you grow in your faith experience, look no further than Rosary Army. Greg and Jennifer never cease to keep me entertained. Sometimes listening to them is like looking in a mirror. They are your average American couple with a slight difference, their main purpose in life is to serve Christ through this Apostolate. I anxiously await each and every episode! This is a great show of real-life catholic life. It is wonderful to hear how other catholic families face challenges of everyday life. I started listening about a year ago. I had to go back and listen to all past episodes. Highly entertaining, genuine, and uplifting. Give it a try. I listen to different podcasts both Catholic and other subjects like news, sports and music. I have begun starting my work days with Gregg and Jennifer while sitting in Houston traffic. This is my absolute favorite pod cast keeping me focused on my Catholic faith plus it is just fun to hear this wonderful couple do their podcast. Inspirational, Entertaining, Funny, Informative, Wonderful. . . I love this "program"! I love listening to Greg and Jennifer share thier lives with us. I can't say enough good words about this show, I am just sad it took me so long to finally find it. But now that I have subscribed I can't wait for each new episode to come out. I can go from reflective to LOL in just one episode. Everyone who wants to be listen to a truely Catholic show with lots of heart needs to not just listen but subscribe. I was searching for something spiritual but at the same time fun and entertaining, and found the perfect podcast. I listen to it when I go home back from work, and I actually enjoy the long ride now with the company of Greg & Jen's funny comments and of course their inspirational devotion to Mary. I might just start praying the rosary most often! This is the one podcast I listen to without fail. I originally started to listen to learn a little about Catholicism, now I feel like I'm hearing from friends. As a very small child I remember looking in to an American family that was portrayed by the Nelsons, although I'm sure full of fiction it portrayed what we hoped American families were like. This pod cast does much the same thing illustrating what it means to be a Catholic family in modern American. I'm sure there are portions of their lives that they rightfully keep private but it appears to be an honest attempt to be candid about what family life can be like. Whether you are Catholic or not, this is a great podcast! Greg and Jennifer explain everything, and they will have you rolling on the floor in helpless laughter much of the time. This is an awesome podcast for Catholics, and non-Catholics alike, really shows you the lives of two people who really are trying to live their faith, although not all of the podcast has to do with faith, it has its zany moments, it's really a great podcast, I recommend this podcast to everyone. I'm a relatively new listener...since I got my iPod about 2 months ago I happened upon your podcast & am now suscribed to this podcast, your video podcast, That Catholic Show & now Catholic Magazine. I just wanted you to know what a blessing it is to listen to you guys each week. You are the epitome of what a married Catholic couple should be. Thank you for sharing your life with us, your work you do for the Rosary Army & for the Lord. God bless you both! These podcasts occupy my lunch hour. I also want to tell you what an inspiration Greg's marathon was. I've watched the video version several times because it is a video testimony to me of Jesus' "footprints" in the sand. Again, God bless you both & your beautiful family! Great program- highly encourage others to subscribe!!! If you are Catholic, or are thinking of becoming Catholic, you should give this podcast a listen. Greg and Jennifer have great charisma and on-air chemistry. It is not preachy and is enjoyable to listen to as just entertainment with a nice Catholic foundation. Be sure to check out the website and try to make a Rosary. It's simple and the Rosary is of great value for Catholics, so if you aren't praying the Rosary give it a go to. It's a foundation to my faith, I struggle also and the Rosary helps keep me going strong. It is really amazing. Also check out other great SQPN podcasts!